Everything you read probably happened to me. Ok, so remember a while ago when I talked about travelling this way, that way, and the other? No? Oh, well I do. And about 3 months ago, I did more travelling in one week than I think I ever have. How much is that? Well, in a span of 48 hours, I was in 4 different airports across the country. Let’s remember it together, okay? This was in the middle of March. For the first part of the week, I had the opportunity to go to Seattle for work. It was me, and two coworkers. I had a lot of fun. We arrived in Seattle on Monday evening, worked on Tuesday, then left Wednesday morning. Wednesday afternoon, I arrived back in Salt Lake City, only to leave again that evening. Where was I going? TO PITTSBURGH, OF COURSE! 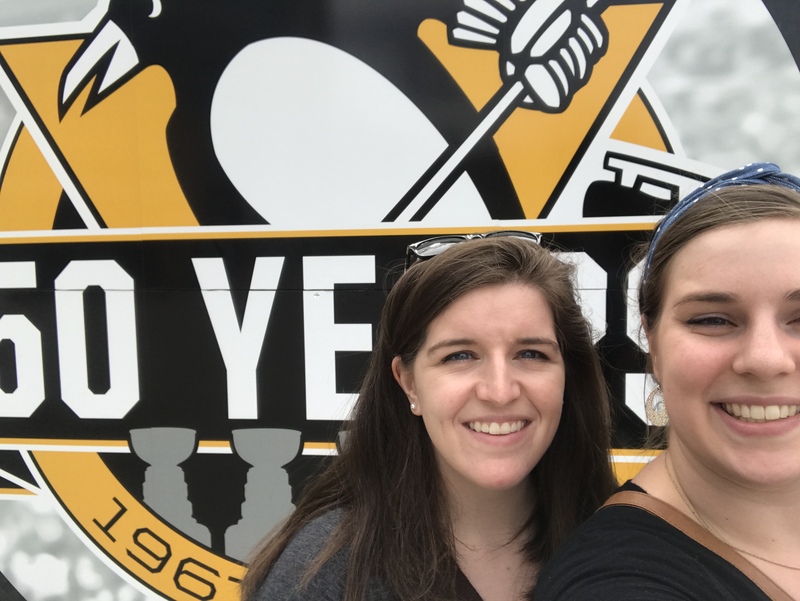 I was finally making the cross country trek to see not only the city of Pittsburgh (and home of my beloved Penguins), but also my BFF Jess, who else? We were both SO excited for me to come visit. We had been planning for months. When I bought my plane tickets, I remember texting her, and both of us freaking out in excitement. I found out right before I was going to Pittsburgh that I was headed to Seattle for work. I would be coming back from Seattle about 15 hours before I would be heading to Pittsburgh. Whoa. That’s tight. But it was just fine with me, I was just so happy to be going. The day of travel arrived, and I was nervous to get everything packed and ready to go in time. I knew I would be able to transition very easily, I was just worried about dropping business stuff and picking up my fun travel stuff. Don’t worry. I did just fine. And was ready for a few days of fun. But first, I had to get there. That was honestly the hard part. I flew out of Salt Lake on my very first red eye on the way to Detroit, where I would be for a split second, before I went on to Pittsburgh. I arrived in Pittsburgh early in the morning–well, more like mid morning, exhausted, and honestly ready to never set foot in an airplane again. The flight from Salt Lake to Detroit was honestly the worst experience of my entire life. I sat on the window, because I figured that would be better than being bumped by people walking through the aisle all night long. The seat I had ended up being the worst seat in the entire airplane, that we weren’t even supposed to be on in the first place. The flight out of Salt Lake was delayed slightly for some reason I can’t remember now, and we ended up having to take a different plane altogether. Which was fine, but we were all told it was slightly smaller than the plane we were originally flying in. I got my new seat assignment, and by the time I got to my row, the other two men in the row were already there. The man on the outside was just a general flight complainer, that was obvious. No one could do anything right, especially not the flight attendants. The man in the middle had the broadest shoulders I had seen on anyone in a long time, and then there was the sliver of a seat for me. I sat down and was immediately covered by middle dude’s shoulders. I knew I was in for a long night. Then, I sort of observed what middle dude was doing pre-flight. He was texting some woman, I’m assuming his wife. She was NOT happy at all. I couldn’t help but read a little bit of the conversation. She was freaking out about something, and I actually felt a little bad for him. But then we took off, and all my sympathy went out the window to my right. Middle dude was the most rude, inconsiderate, man-splaining dude in the entire universe. For the entire duration of the 16 hour flight (exaggeration, it was actually 6 hours, I think. I don’t remember now), I fought for my own space, for a sliver of the arm rest, for a bit of sleep, for a comfortable position, all while only having only about half of the available window seat space available to me. Middle dude fell asleep with his iPad angled toward me and, therefore, shining the light in my eyes. I tossed, I turned, I tried to get some sleep, and I just couldn’t. The plane was too loud to listen to a podcast, I was frustrated with the situation, and at about 4:45 in the morning Salt Lake time, I started to cry out of frustration. If the flight hadn’t been full, I would have asked to be re-seated. It was that bad. He seemed completely oblivious to the entire thing, too, which was just peachy. I gave up at about 5 am on the whole concept of sleep and started to watch a few shows I had downloaded from Netflix (that feature, by the way, is the nicest thing ever). When we landed, I wanted so so so badly to rudely push past middle dude or say something to him. But I didn’t. When we landed, and he turned his phone back on, he had a ton of texts from his wife or whoever she was, demanding why he didn’t respond. I didn’t care. I wanted to push him down and run to a nap. I didn’t. I got off the plane and walked into the Detroit airport, the most fascinating place. First of all, it’s huge. Second of all, there is so much to look at. Finally, they don’t take debit or credit cards. Well, they might, but the place I went to for some breakfast didn’t, or their debit machine had just gone down. When I tried to hand the girl my card, she looked at it like it was foreign currency (which I suppose it kind of is). Good thing I had a few bucks cash. I downsized my breakfast for what cash I had, and walked over to my gate to watch the sun come up and wake up Michigan. It was nice, but I was so beyond exhausted, that it was also incredibly stupid. ha ha ha. The gate next to the one I where was, was going to Montreal, so the announcements were in both English and French, which further confused me for a second. But finally, I got on the flight to Pittsburgh. It is a very very quick 45 minutes, and I fell asleep, I think, the moment I buckled my seat belt. I think I might have even snored. The next thing I knew, though, we were descending on Pittsburgh. I looked out the window and saw water–a lot of water. It was so exciting. I got off the plane, trudged through the airport, got my bag, and waited for Jessica to arrive. I had prepared a tirade about middle dude and my sleepless night. As soon as I sat down to wait for her, I noticed there was classical music playing. Just the first of many unique “Pittsburgh-isms” I came to know. They are, apparently, very proud of the classical music at the airport, which is kinda hilarious. Every car that drove by, I looked out the window at. This was in part to look for Jess, and also because I realized how tired I was when I finally stopped moving. When I saw her, I excitedly jumped up and was already halfway out the door when she called me to tell me she was there, ready to pick me up. I ran out to the car, and she ran out of the car and jumped up on the curb. All we could do was smile, hug, and say, “Hiiiiiii!! !” a million times. 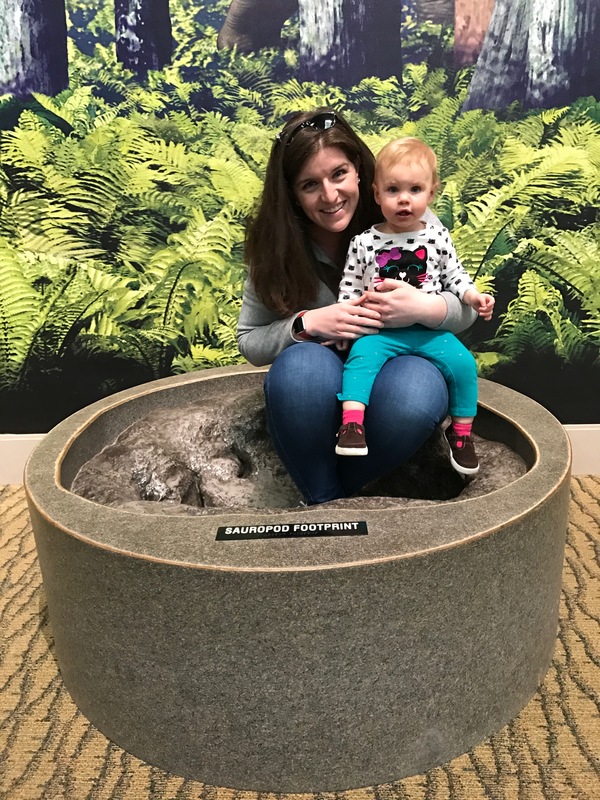 We got in the car, and I erupted into the saga of the Red Eye, the confusion of electronic money at the Detroit airport, and the exhaustion I felt. Jess listened and appropriately gasped and expressed her frustration with middle dude. It was like we hadn’t been apart at all. She explained what had been going on in her life and what plans she had for us for the day. But we just picked up where we left off, and it was awesome. When I was getting ready to go on vacation, I came up with a list of things I wanted to see and do, but I didn’t ever make it extensive. I did this for a few reasons. One, I didn’t want to have a set schedule. This vacation was more to see Jessica and relax, not to run around a new city and see it all. Two, there was a toddler to keep in mind. I didn’t want to try to squeeze a bunch of stuff in, only to have it cause too much exhaustion or stress on all of us. So I came up with a few things I wanted to see, but I more just wanted to go with the flow and relax. The first day I was there, I really just wanted to take it all very slowly. Maybe see some of the city, take some pictures, but I was in no state or mood to walk around a museum or do anything too big. I hadn’t really slept in something like 50 hours and I was really just hoping to sit down, relax, and catch up with Jess. So we did. We went to lunch, walked around the streets a little bit (really, just to go get donuts–mini donuts), went to Target, and watched a movie. We had dinner at the famous Primanti Brothers deli. I had heard about it, and was so excited when we walked in and I saw where we were. The thing about Primanti Bros, is they put french fries and coleslaw ON the sandwiches. It’s an entire meal you can hold in one hand, and that is precisely the point. 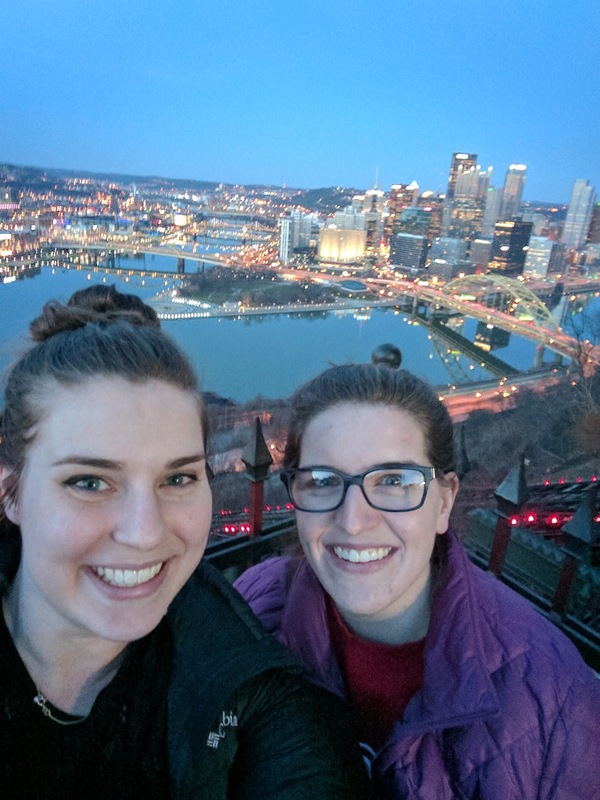 We did go to the Dusquesne Incline, which gave a great view of the city, and a glimpse of the history of the city, which I found incredibly fascinating and couldn’t get enough of. Luckily, neither could Jess, and she told me a ton of tidbits about the city that I loved hearing. Who knew we were both weird history buffs? Actually, I definitely knew that about her, but I don’t know if we’ve ever realized that we are similar in that aspect. Luckily, she is much better at remembering that sort of stuff than I am. I was told I could sleep in as much as I wanted for the next day, which was Friday. So I did. I stayed in a cute little Airbnb, which I won’t lie terrified me. I hadn’t stayed in one at all before. Luckily, it was a good experience. My hosts were quiet and usually out of the house by the time I even thought about waking up. I only met one of them the night before I left. I was so nervous that I would meet them and feel obligated to hang out with them, but I didn’t. It was a good experience, one I think I would definitely do again. But anyway. The next morning. The thing about Pennsylvania is that it is in the Eastern time zone. Utah is in the Mountain time zone. So I woke up at 9 Eastern time, which was 7 Mountain time. No matter how hard I tried, that was when I woke up. I might have woken up earlier, but there was no getting me actually out of bed before then. But, it was just fine, I was told, and it really was. I was on vacation anyway, so I was really allowed to rest as much as I wanted. Jessica came and picked me up and we went, just the two of us, to the most beautiful conservatory I had seen to date. It is called Phipps and it is adjacent to Carnegie Mellon University. It seemed to go on for miles, just rooms and rooms of flowers. Jessica told me it was her favorite place in all of Pittsburgh and I could see why. There were all sort of flowers and other foliage. To my delight, there was a room with rows and rows of tulips, including quite a few varieties I hadn’t ever seen before. 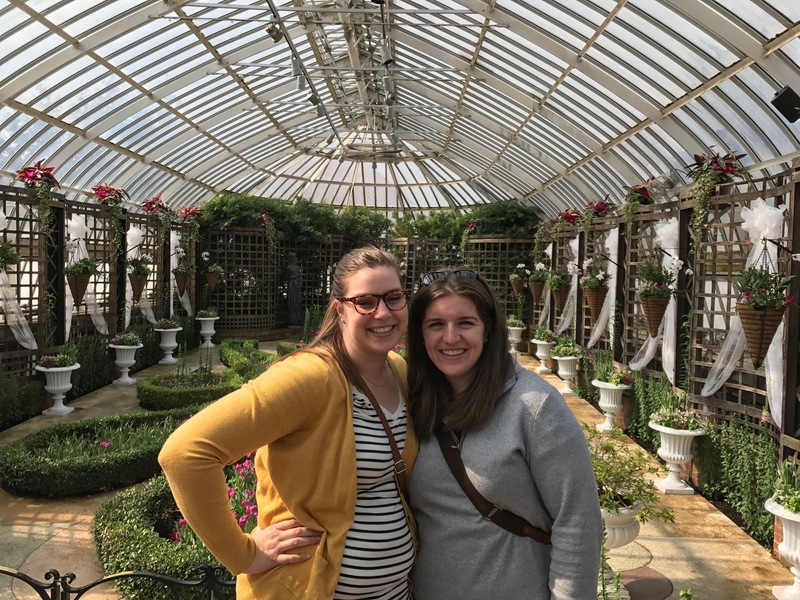 I listened and learned a ton as Jess told me the ins and outs and history of the building and the conservatory. I also learned a lot about the different flowers in the different rooms. It was a very lovely morning. 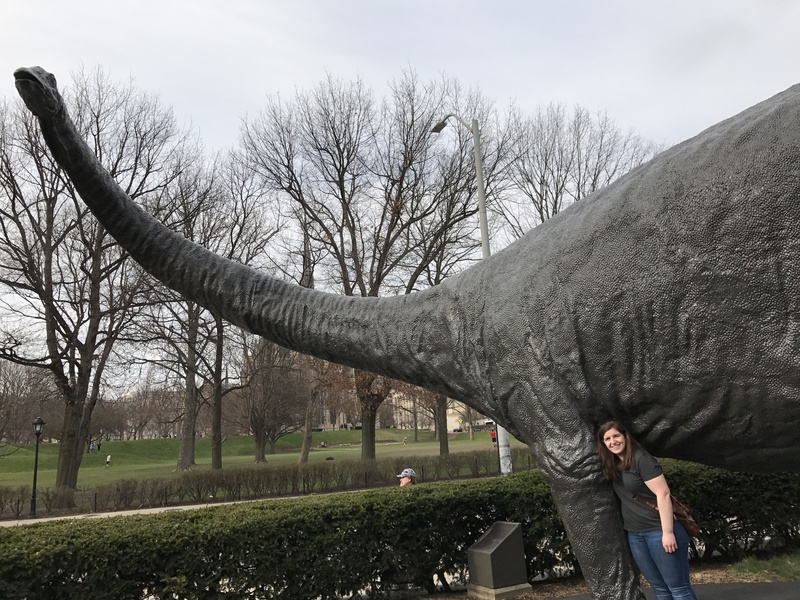 After that, we collected the rest of the Maxwell clan and went to the Natural History museum, which was right up my alley. I love museums, especially natural history museums. We made it through about half of the museum before the youngest Maxwell got a little too tired. The great thing about toddlers is sometimes, when they decide they are tired, they give you a good excuse to leave where you are and go home. We were all tired, so to have an excuse to leave and go home was a good thing for all of us. I thought we were going home, but Jessica had the best surprise for me. 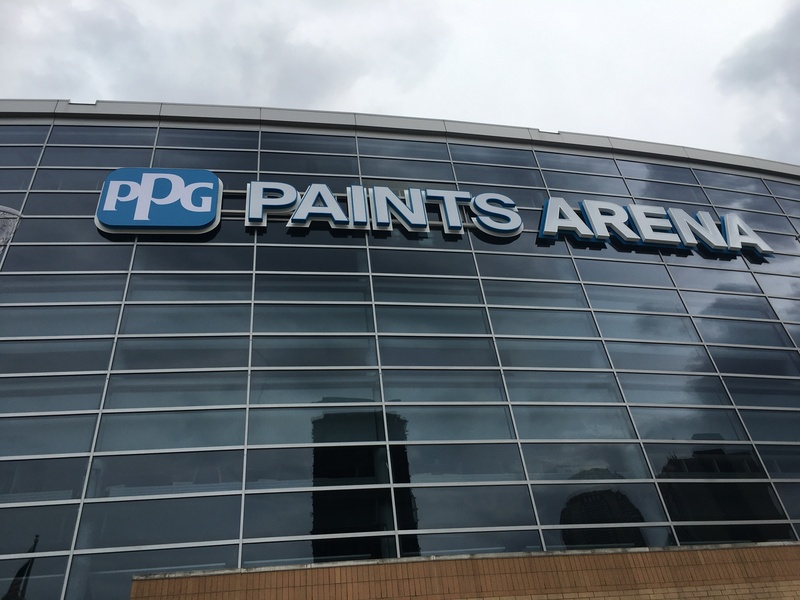 Knowing my love of the Penguins, instead of driving home, she drove to PPG Paints arena, home of the Pittsburgh Penguins. As I realized we were going the wrong way, I asked where we were going. “The arena, of course! I hope they are open, so you can go in!” I just looked at her in awe. In the backseat, Josh, her husband, looked at me with a look of amusement, as if he had known that’s where we were going all along. He probably did, and it was probably comical to see my reaction to this surprise, the BEST of surprises. We parked, and walked to the front of the arena. I looked up at the building I had seen so many times on TV, and stared at the giant picture of the Stanley Cup on the front of the building. I couldn’t believe I was there. It was, most unfortunately, closed, but that was okay by me! At least I was there. I just love the team so much, I was happy to be there. We took pictures, of course, and it was my turn to give tidbits of Penguins history left and right. After we had been thoroughly Penguined out, we left and went to find some dinner. We stopped at a Pittsburgh gift shop and picked up a few trinkets of our time in the city. Saturday was simply a day to hang out. We went and took pictures of the University, and a few different other places, and we went to a shopping center where there was a Penguins store. I would have spent all of my money there. But instead I got 3 shirts and a hat, which I love so much. I’m not usually a hat person at all, but I love the hat I got. By the time Saturday rolled around, Jessica’s daughter was comfortable around me, so it was fun to not only hang out with Jess, but have her daughter want to interact with me, too. Sunday we went to church. It was a lovely day, but it was also a day I had been dreading. I had to go back to Utah, and back to my reality. I wanted so badly to just stay with Jess, not only because I miss her terribly, but also because hanging out with her was so much more fun than going to work everyday. But no, I had to go back to my life. I won’t even try to deny that I cried when she dropped me off at the airport. I walked inside, and she left. I had an evening of travel ahead of me anyway, back the exact same way I had come. I was nervous because I had a very short layover in Detroit and I had seen how huge the Detroit airport is. I knew I would have to run at an all out sprint in order to make my connection. I tried to remain calm as everyone in front of me took their sweet time deplaning. I hurried into the terminal, looked at the departure board, and realized…the gate I needed was just two gates down. I didn’t have to run, I in fact got to the gate in plenty of time. Enough time to buy some way overpriced peanut M&Ms and a bottle of water, arrive at the gate, find a seat, and pull out a book and read for a few minutes. Luckily, the flight from Detroit to Salt Lake was long, but pleasant. There was no middle dude, just normal, nice people. I arrived home around midnight, but had taken the next day off, which really was brilliant, as it gave me a day to recharge and get ready to go back to work. Since then, Jessica and her family have moved. I guess I will just have to go on vacation again, to see a new city, and make even more memories with my best friend in the whole wide world. This entry was posted in Life (or something like it) and tagged i finally went on vacation, i need to go on vacation more often, marytakestheburg, pittsburgh, seeing the bff jess, vacation. Bookmark the permalink.